First Baptist seeks to nurture the spiritual and emotional growth of its children, preschoolers, and their families through a variety of weekly opportunities for learning, worship, missions, service and special programs throughout the year. Provide opportunities for spiritual development of children though our educational programs and by incorporating children in our worship services. Provide parents with resources to nurture and encourage them to take an active role in their child's spiritual developments. Give strong emphasis to outreach needs and suggest ways to reach out to inactive members and prospects. A fun time for kids filled with activities, bible study, prayer, etc. 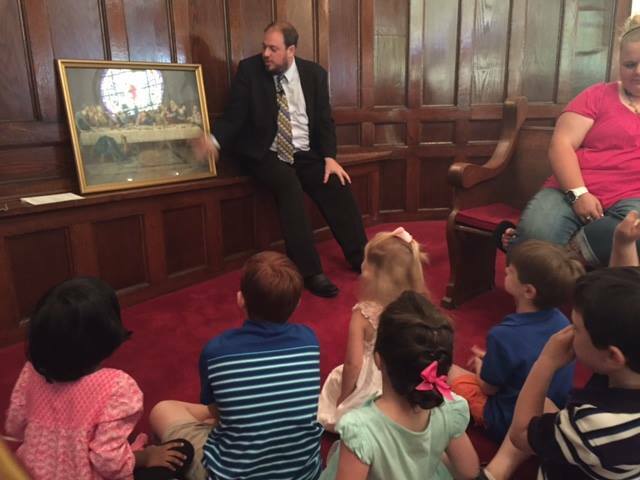 One of the ministers leads a time just for older preschoolers and children during the Worship Service. A supervised place for toddlers and preschoolers to go during the worship service; games, stories, snack, and fun play time. A time of music for preschool boys and girls ages 2-5. Young Disciples Choir @ 6:30 A time of music for boys and girls in grades 1-6. Mission Friends @ 6:00 PM - A fun time of missions for preschoolers ages 3-5. Children in Action @ 5:45 PM A time of learning and missions for boys and girls in grades 1-6.